I never would have thought that I would have something in common with one of the K. Kardashians, but as luck would have it - I do. I was at Stop & Shop the other day and found myself face to face with Khole Kardashian and the US Weekly headline that Khloe and Lamar are preparing to undergo IVF treatments. Sources say "With Kim Kardashian by her side for moral support, Khloe gave up some blood so the docs could evaluate her hormone levels. She’s waiting for the results, and will then get a stylized treatment program." Well I don't know how "stylized" her treatment program will be or how fashionable she can make nightly injections look, but I'm sure where the rest of us common folk get sticker shock by the cost and apply for financial aid through Fertility Lifelines, this will just be a drop in the bucket for Khloe and Lamar. *sigh*. I'm also fairly certain we will be able to follow her step-by-step process on her reality show. Yay! (barf). Similar to Khloe, I can also understand how seeing those around you get pregnant no problem can stir up a wide range of emotions from sadness to just plain ill-willed. I don't follow them to closely, but I know her sister is pregnant with or just had her second kid. When pregnancy and birth overlap with someone else's infertility and frustration, it is enough to make you crazy. I wonder if she will give up Facebook too. Other famous IVFers are Marcia Cross (Desperate Housewives), Jane Seymour, Emma Thompson, Celine Dion, Courtney Cox, and Brooke Shields. In other news, I ran what will probably be my last 5K until 2013. Sunday was the NY Giants Run of Champions at Metlife Stadium. I didn't really have many expectations, but finishing in less than 30 minutes would have been nice. 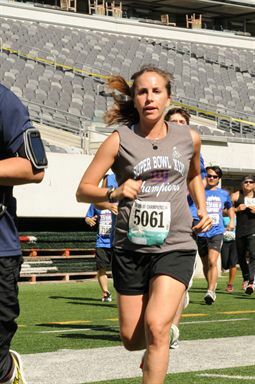 The race was pretty awesome because the finish line was the Giant's end zone. When else will I have the opportunity to make a 100 yard run on Giant's turf. My friend Allie, from the gym,ran with me and if you were fast enough to register, you could meet with former Giants before and after the race. I did see Amani Toomer while we were wandering around and getting registered, only I didn't recognize him. He was extra skinny from training for and running the ING NYC Marathon.